A couple weekends ago, my husband and I celebrated our 10th anniversary (which is actually today – happy anniversary babe!) with a getaway to Savannah, Georgia. It was my second time visiting and my husband’s first time. I think it’s safe to say it will not be our last time. We fell completely in love with this little city and all of it’s charm. We stayed on Jones Street on the historic side of town and spent our 2 days there walking the streets and eating. It was perfect. 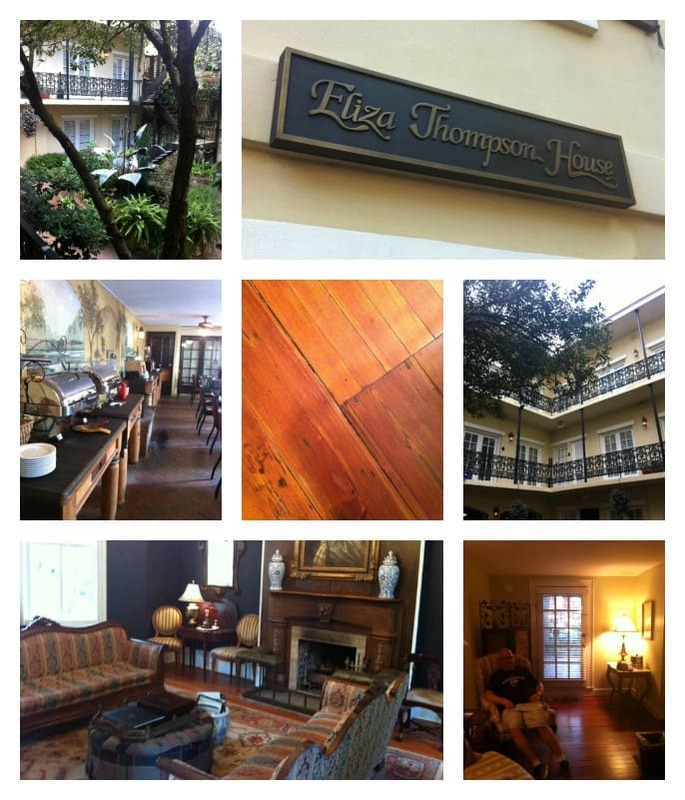 Eliza Thompson House – a very charming historic bed and breakfast right on Jones Street, which is exactly what I was looking for. Our room was called The Savannah Room and the front door literally opened up right to the street under the stairway to get into the main house. Breakfast was served in a beautiful open courtyard every morning. We thoroughly enjoyed starting off our days eating outdoors, reading the newspaper in the rockers with our coffee when we were done. Breakfast was close to the same both days – a variety of egg casserole, hash browns, bacon & sausage, assorted breakfast breads, yogurt, berry compote and granola. In the late afternoons, wine and appetizers were set out in the sitting room and dessert was served later in the evening. It was such a nice touch and I’m glad we were able to enjoy it at least once both days. This was the first time staying in a bed and breakfast and we loved it. It was perfect for a weekend and the location could not be beat, we were in walking distance to pretty much everything. We were just in awe of the history and condition of the house, the whole experience was just wonderful. 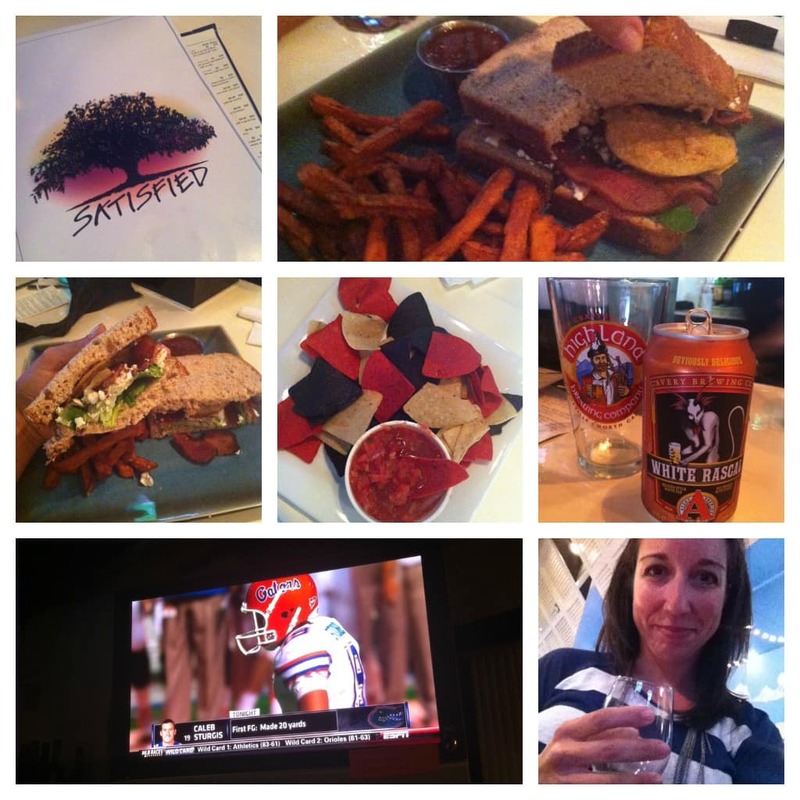 Satisfied – Of course, the night we arrived there was a Gator game so our first mission was to find a place that would be showing the game. We found this place after some research and calling them to make sure the game would be on their screens. It was a great place to watch the game (even though we were 2 of a total of 4 Gator fans in the whole place and had to sit through lots of cheering against us). We sat at the bar and the bartenders were super friendly and treated us very well. They had a great beer and wine list (craft beers if you are into them) and a nice menu. We ate chips and salsa, Larry ordered roasted wings (awesome wing sauces!) and I had the fried green tomato BLT. I wanted to love the BLT (I didn’t hate it) but I really think the bread should have been toasted. 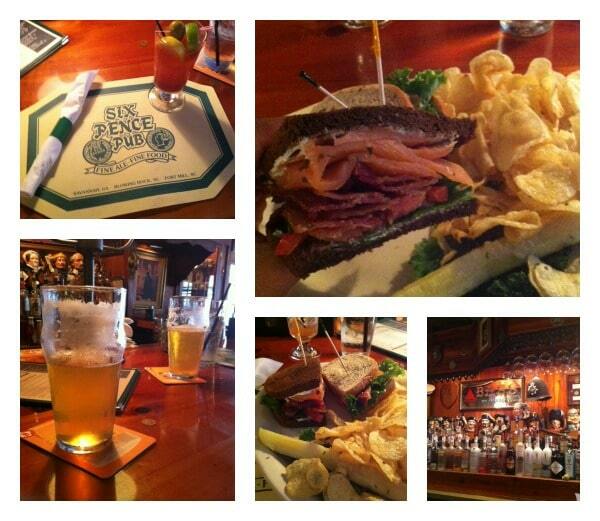 The bread was awesome, but just too soft for a BLT in my opinion…so next time I’ll just ask them to toast it. 🙂 We would definitely go back if we are in town and needed a sports bar fix. Huey’s On The River – We actually came here first when we got into town and wanted to grab lunch before checking into our hotel. Great place to start off our weekend. Their drinks hit the spot (just look at those Bloody Mary’s!) and the food was delicious and filled us up. Larry had Shrimp and Grits and I had a Fried Green Tomato Muffaletta (I could not get enough of fried green tomatoes this weekend). The restaurant sat right on River Street and with seating out on the street or inside. It was a nice day so their big glass doors were opened up with views of the street. River Street was fun to check out, but it was busy. Lots of bars, restaurants and shops…and people. There was a festival going on and we had fun walking around, but I much more preferred the quieter historic side of Savannah. 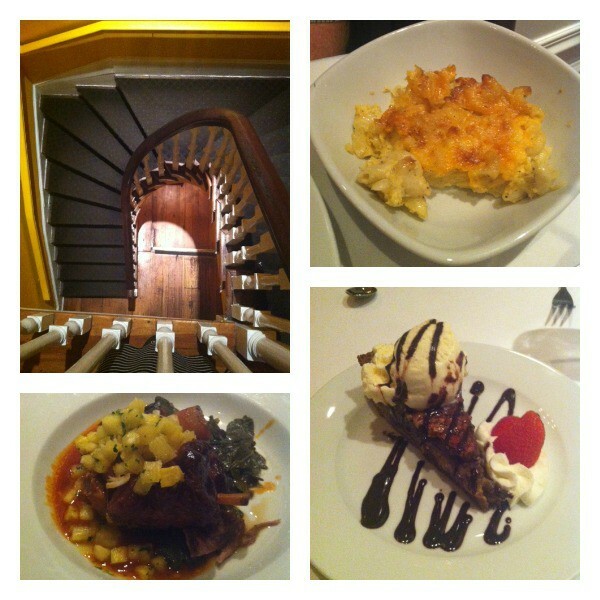 The Olde Pink House – We had our celebratory anniversary dinner at the Olde Pink House. I had eaten here a few years back with friends and I couldn’t wait to take Larry here. I think most people who have visited Savannah have probably eaten here, it’s such a neat restaurant set inside of an 18th Century (haunted?) Mansion. It’s a pricier restaurant so perfect for celebrating special occasions. Everything we ate was absolutely delicious. We started our meal by splitting the ceasar salad with cornbread fried oyster croutons (so good!) and a basket of rolls and corn muffins. I ordered the same thing I had the last time I was there (I have been thinking about this dish for years, people), the Crispy Scored Flounder with Apricot Sauce (served with grits and collard greens). Be prepared, this fish is served WHOLE (no head, I know someone is wondering) and is cooked perfectly. You are given instructions on how to eat it when served (which I appreciated) and I’m telling you it is so so good. The apricot sauce is to die for. Larry had the Braised Pork Shank with Pineapple Glaze, Macaroni and Cheese and Collards. The pork shank was so tender and just fell apart and the sauce was amazing and I am determined to recreate it here at home. And dessert? We almost couldn’t do it, but are so glad we did – chocolate pecan pie. Needless to say…we opted to walk the mile back to our hotel. Zunzi’s – We hit Zunzi’s on our way out of town. I’m not going to lie, I didn’t want to eat another thing at this point. I’m so glad we stopped here though, it was definitely worth it. My friend Katie recommended Zunzi’s to me, and the more I researched it, the more intrigued I got. Apparently it’s an extremely well known foodie spot, and the line out the door throughout the day attests to that (love that they put out a bucket of shade umbrellas on the sidewalk for people waiting out in the sun!). We got there even before it opened and the line was already about 8 people deep (at 11 am!!). All I have to say is the food is interesting and so delicious. Larry got the infamous Conquistador and I had the Portobello Sub. Ah-mazing. Zunzi’s is quite “quaint”, it’s a walk up order at the counter type of place. We were lucky to get a table in their outdoor sitting area but had planned on walking half a block to eat on a bench in a square. The owner made her rounds outside, saying hello to regulars and checking on all of her customers. Great little place to eat, love Zunzi’s! Friends, Savannah, GA was amazing, there is really so much to see and do. It was the perfect place for Larry and I to get away to (it was a short 4 hour drive for us which we loved). 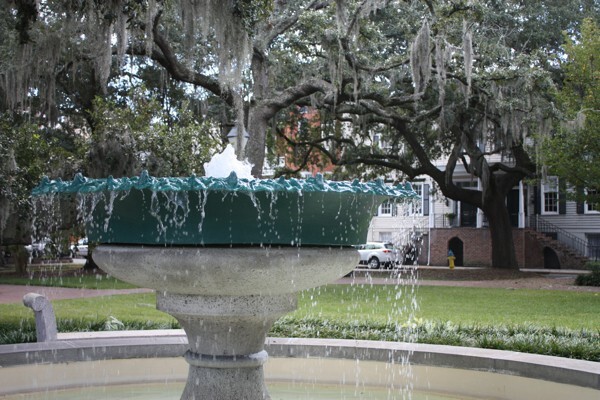 Being outside, under all those huge oaks dripping with Spanish moss, walking old streets and soaking in all kinds of history…you can’t help but leave feeling content and totally refreshed. It’s a place I highly recommend if you are looking for a relaxing get-away with your spouse, family or friends. We can’t wait to go back and bring our little ones to experience it too! Looks like such a fabulous time! Great post babe. I love you very much, and can’t wait to go back. Happy 10 year anniversary!! Oh my goodness – another place I need to add to my “must visit” list!! And happy anniversary!! Love this recap – Savannah is our favorite place in the world (I have an entire tab on my blog dedicated to it!) – we are working hard on trying to move there! We’ll be headed back within the month for our 20th visit in 6 years – yeah, seriously! 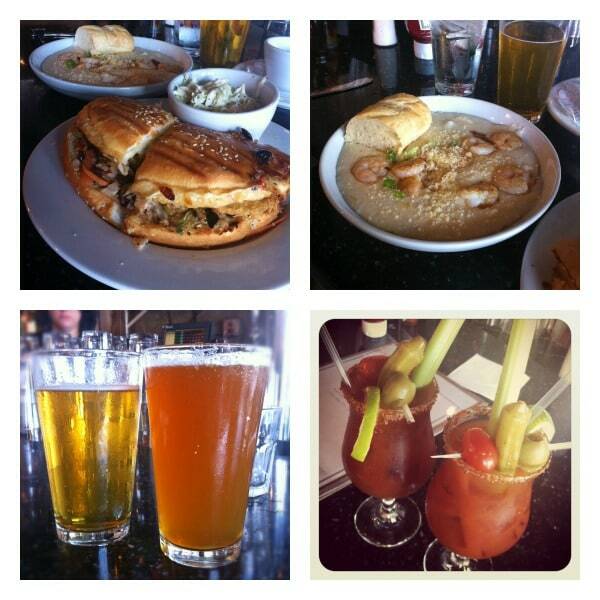 Believe it or not, the only place you mentioned that we’ve tried is Huey’s – we love breakfast there! The Olde Pink House and Zuni’s are on our short list already, but now I have a few more to add to it! Oh Pam I have to check out your tab! We really hope to get back up there soon with the kids, maybe when it gets cooler around the holidays. We were there the same weekend! We went to celebrate our birthdays. 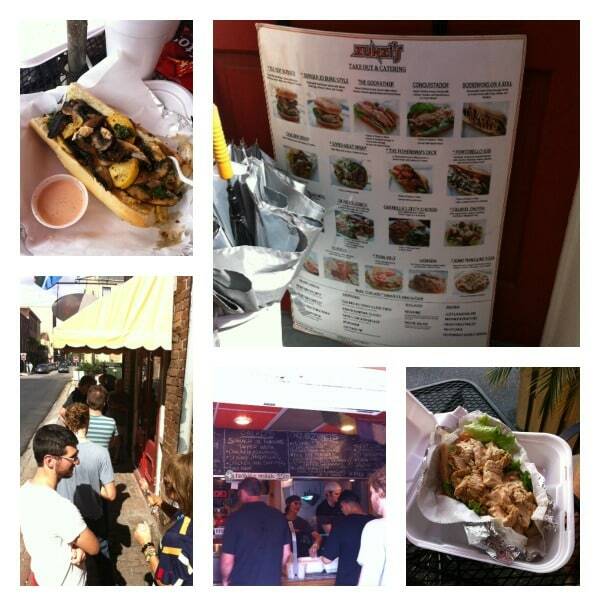 (We also went to Huey’s!) Beautiful…I could go back again in a heartbeat, though our drive was a bit longer, closer to six. Well worth it! That is too funny that you were there the same weekend!! Where else did you eat? Paula Deen’s The Lady & Sons was the highlight! We’re big FN fans and I’ve hit up other restaurants in NYC (on biz trips 2-3x a year) so the chance to visit another one was too good to pass up. Loved it! I know it’s cliche for Savannah visits, but we loved it! We were only there Sat & Sun, due to the long drive, but we also went to Wet Willie’s (lol, I have to say, for being a Mom, it was pretty fun! ), the River Street Candy store and a cafe on Sunday, on the way out of town. I just realized, we were at the same pub! What night were you there? We stopped by Sat night, around 8:15-8:50. We were booked for the 9pm ghost tour, which was a lot of fun. I’d love to go back again, but we are moving soon so I doubt we will. Beautiful place! I SO want to go to Bobby Flay’s! Guy Fieri’s are also on my list when we get back to Cali full-time. I’ve been to Morimoto’s and Tom Colicchio’s in NYC. My husband planned this Savannah trip, so he’d made the reservation via phone a week or two ahead of time. When we left Sunday morning, the line for walk-ins was very long — that place does some serious business. Her shrimp and grits were fantastic! After living in the south for 2.5 years, we’d never had them until a month ago when we spent a weekend in Asheville; now I have got to learn how to make them since it’s not a common CA food. I’ve grown to really enjoy this southern food and will miss it! Blue Orb Ghost Tour was fantastic! Next time, I want to do their Zombies tour. We picked up Tobias’ book at the end of the tour for $5. Fascinating history. Awesome anniversary trip, Aggie! Savannah is on my list of places to visit. Happy anniversary! Thanks Cassie! 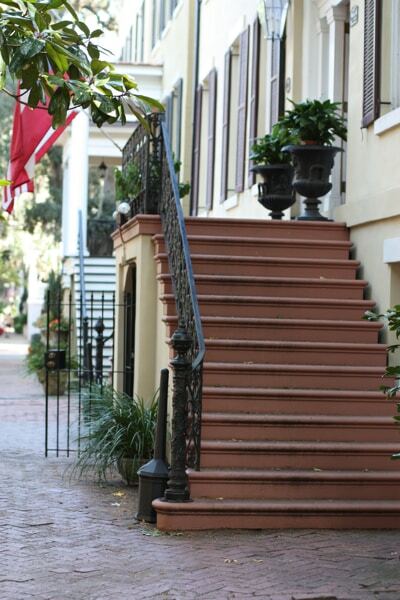 You would love Savannah. I love this post! We’ve been wanting to take a roadtrip down to Savannah and this has given us some great ideas. Thanks and happy anniversary! 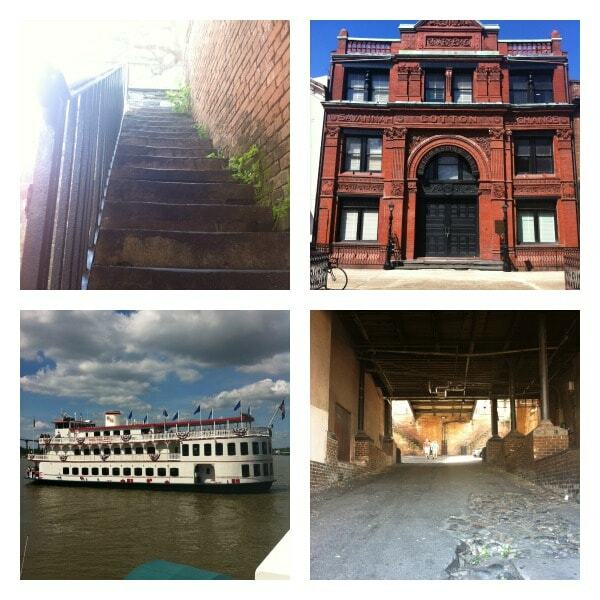 I love Savannah and now I want to go back! I haven’t stayed in a Bed & Breakfast before, but we might have to try it. Happy Anniversary! Happy Anniversary! We love Savannah too! We stayed at at the Marshall House on our last trip there right next to a haunted room. It was wonderful. We rolled out of The Lady and Sons full to the gills. 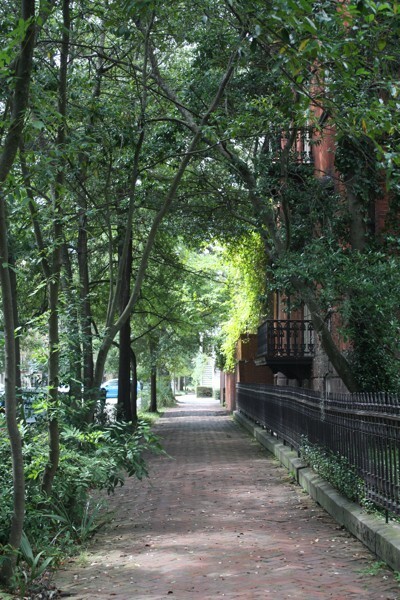 Love River Street and those trees are hauntingly beautiful. Happy anniversary! Looks like a great trip and some amazing food! Oh wow, and Happy Anniversary to you! I love Savannah! I live in GA too, but Savannah is just a whole different ball game! The photos are wonderful. Looks like you had a fantastic time! Did you make it to the Lady & Son’s to see Paula Deen, or Bubba’s Oyster Bar? I would love to visit both. I’m absolutely in love with that city 🙂 I went to college about 40 minutes north of it so I definitely miss the short drive down on weekends!! 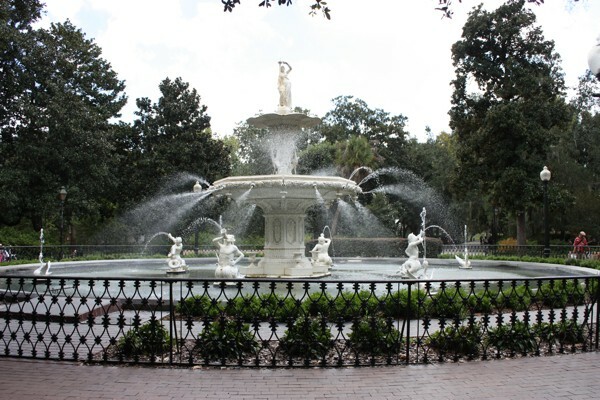 Wow – I feel like I just went to Savannah and had the time of my life!! (And I didn’t gain a pound – LOVE that about blogs, haha.) Seriously though, it has always been on my bucket list and it is now officially written in pen. Thanks for taking us on your anniversary weekend. CONGRATS on 10 years! What a great anniversary getaway! I’ve never been to Savannah and hope to do so someday. I’ll bookmark this lovely place so I’ll know where to stay when we go. Thanks for sharing & wishes for many more anniversaries! Hmmmmmm…I’m starting to think about where I want my birthday trip(40, : – 0 ) to be this February. I think I just put Savannah on the short list!